With a high output 350cc displacement and long-stroke design, Honda's 15HP Long Shaft BF15 LHU is a top performer providing optimal torque at any speed. Programmed Ignition (PGM-IG) also accurately controls ignition timing during start-up and across the entire rpm range for exceptional overall performance. Thanks to their lightweight design and fold-away lifting handle positioned at the exact balance point of each engine, the engines are made easier to transport. Cruising is improved and more comfortable with Honda's unique pendulum-motion system. This system feature is designed to minimise engine vibration and maximise user comfort. The BF15 is available in many model variations, to include tiller or remote, manual or electric start and power tilt options. Convenient foldaway lifting handle positioned at the exact balance point of each engine makes it easy to carry the outboard in a level position. Programmed Ignition (PGM-IG) accurately controls ignition timing across the entire rpm range for optimum overall operation. High Output Charging - 12amp (electric start) and 6amp (manual start) outlets maintain battery charge and keep electronics powered, even at trolling speed. 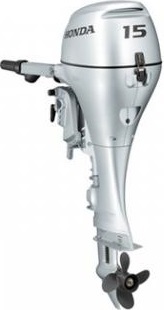 An automatic decompressor on the BF15 reduces recoil effort and ensures easy starting. 4-Front corrosion protection. A patented, 'double-sealed' multi-layered paint process. Sacrificial anodes and stainless steel technology, along with waterproof connectors, all enhance corrosion protection. Tags: Honda BF15LHU, 15hp manual, recoil, start, With a high output 350cc displacement and long-stroke design, the BF15 is a top performer providing optimal torque at any speed. Programmed Ignition (PGM-IG) also accurately controls ignition timing during start-up and across the entire rpm range for exceptional overall performance.